For almost 40 years, feminist, environmentalist, and human rights advocate Rebecca Solnit has shepherded activists and animated a spirit of community. Her more than 20 books—on subjects as disparate as natural disasters, origin myths and folk tales, tech’s effect on the humanities—supplemented by dispatches from some of this century’s most consequential political events like Occupy, The Women’s March, Standing Rock—have earned her street cred, garnered critical acclaim, and amplified her reputation as muse. Then comes the torch-carrying, genital-grabbing age of Trump, when emotion is whacking the sense out of reason and truth, when rectitude, it seems, is all but dead . 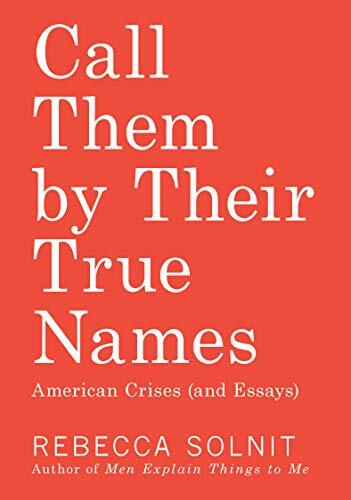 . . Solnit’s new collection of prose, Call Them by Their True Names: American Crises (and Essays) arrives like the cavalry. Rebecca Solnit, by any other name, is on a rescue and rally mission. In a foreword to this rousing collection, Solnit swiftly establishes a unifying theme. Her scepter is language. “It begins with naming,” she writes. “The first step in the process of liberation.” The essays here cover enormous territory, but the distance between, say, the homeless now in San Francisco (“No Way In, No Way Out”) and Acoma Pueblo warriors of the 16th century (“The Monument Wars”), is bridged by Solnit’s dedication to storytelling, to sharing a lexicon that galvanizes belief in amelioration. She lasers salient, if predictable, examples of freighted words, gender and race specific, e.g. “shrill, slutty, hysterical,” “uppity, lurking, loitering,” then provides examples of new coinage that flips focus, “walking-while-Black,” “prison-industrial complex,” “affirmative consent,” “unburnable carbon.” Solnit notes Silicon Valley’s vernacular, where memes like “sharing economy” and “openness” appear to disguise intention. Terms like “surveillance capitalism” push back. Solnit reminds us that precision and clarity in language matter “as gestures of respect,” a deceptively simple recognition that could be used to fortify civil discourse. She motivates with an idea that was once axiomatic: We are only as good as our word. One’s word as bond was first prescribed in the Old Testament’s Book of Numbers and, reporting its persistence, is now a hiphop meme (hear Wu-Tang Clan) signaling integrity. “If your word is junk, lies, disposable pitches, you’re nothing.” She’s talking to you, Donald Trump. Solnit bears down on the significance of Hannah Arendt’s expression “banality of evil” and the sudden popularity of The Origins of Totalitarianism, in which Arendt wrote in 1951, “To authoritarians, language is a weapon, usually deployed in the service of an emotional half-truth: something you believe to be true, even if it isn’t.” We, as Solnit remarks, should not be surprised by apparent prescience. In fact, Solnit displays a talent for prophecy. She seems to identify zeitgeist long before mainstream assimilation. The word “mansplaining” was created in response to Solnit’s original essay “Men Explain Things to Me.” Another word she’s made revelatory is “wandering,” having devoted several books to lyrical explorations of its meanings that include all the psychological hikes, strolls, and marathon runs that occupy daydreaming, remembering, imagining the future. Solnit’s rhetorical style reflects a leviathan curiosity and a palpable pleasure in thinking things through. Her idiosyncratic lists and complex tropes are sometimes long runways for liftoffs or landings of big ideas. She’s in the business of linking. In “Preaching to the Choir,” Solnit names “correspondence” as means and mission, connecting an exchange of letters, the existence of affinities, and the kinship that is strengthened through conversation.